Ozzie Newsome clearly uses PlayerProfiler. With the 26th overall pick in the 2015 NFL Draft, Newsome must have been pleasantly surprised to see a wide receiver with a dominant college resume (36.6-percent College Dominator Rating, 20.0 Breakout Age, and 20.9 YPC) who also owns a 99th percentile Height-adjusted Speed Score (HaSS) still available. 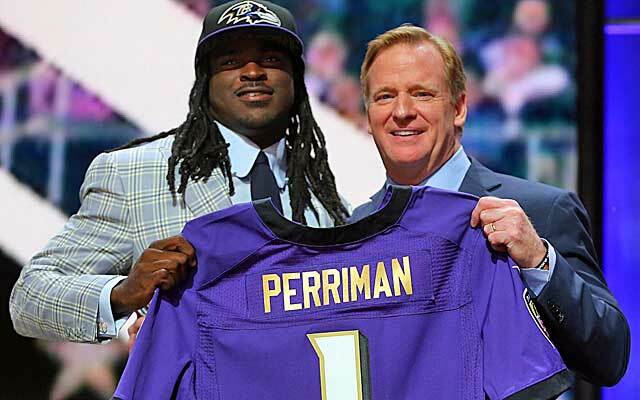 Even the coolest GM in football must have been shaking as he submitted the Baltimore Ravens’ pick: Breshad Perriman. Standing at 6’2″, 212 pounds, the 21-year old wideout from the University of Central Florida boasts truly incredible workout metrics. Perriman runs a 4.30 40 yard dash, among the fastest times in the league (note: PlayerProfiler adjusts pro day 40-times +0.05 seconds). When a guy that big is that fast, visions of Julio Jones immediately come to mind. Perriman’s 121.9 Burst score is also above league average (52nd percentile). Breshad Perriman is just a fantastic rookie prospect. When I think about Perriman’s rare combination of size and athleticism, and then hear this praise from a former teammate, I start to daydream a little. I will be the first to admit that I have become a self-identified Perrimaniac. After Torrey Smith signed with San Francisco, the Baltimore Ravens were left without a true split end/X receiver on the roster. For this reason, Breshad Perriman and his 4.30-speed going to Baltimore was the best landing spot for any rookie wide receiver in 2015. As a first round pick, Perriman is almost guaranteed to start in week one and be an integral part of the offense from the get go, which gives him a great chance to produce fantasy points both early and often. With the loss of Torrey Smith and Owen Daniels, the Ravens lost approximately 160 targets from 2014. When you consider that Steve Smith absorbed 130 targets last year and that he’ll be 112-years old at the start of this season, the fantasy opportunity for Breshad Perriman is palpable. Even if Kamar Aiken and Marlon Brown are more polished route runners, neither represents a significant threat to Breshad Perriman‘s 2015 targets because Perriman’s reputation with the Ravens franchise is bolstered by his first round draft capital, superior college resume, and dominant athletic profile. Just as Julio Jones was incorporated into the offense early in his career with the Atlanta Falcons, Perriman’s size, speed, and burst makes him the perfect fit for the Ravens’ split end/X receiver position. Running deep routes and double moves, Perriman’s skill set is perfectly suited to threaten NFL defense vertically and create better spacing for his teammates’ underneath routes. Another boost for Breshad Perriman‘s potential fantasy explosion is the fact that the Baltimore Ravens offensive line has been steadily improving. In 2014, the Ravens offensive line scored a 126.8 pass blocking rating on PlayerProfiler (4th in the league). Exceptional pass protection will give Joe Flacco enough time in the pocket to wait for the receivers running late breaking and/or deeper routes to get open before he releases the ball. Last season Flacco unleashed the deep ball 71 times, good for 4th in the league. It’s also worth nothing that the 6’0″ Torrey Smith and the 5’9″ Steve Smith were tied 5th and 6th in the league on red zone targets with 17 and 15 targets respectively. It follows that at 6’2″, Perriman should quickly become a favorite red zone target. With Breshad Perriman playing the X receiver/red zone target hog role on relatively productive offense that could finish in top-10 in total plays run in 2015, his upside is phenomenal. All things considered, Breshad Perriman ticks all the boxes required to achieve WR1 status in fantasy football in the long run. In dynasty leagues, Perriman should be a drafted in the top-3 wide receivers, but rarely gets selected that early. In redraft leagues, his current ADP is 83.5 per MyFantasyLeague.com, which puts him in the 6th-7th round range in 12-team leagues. It is also interesting to note that, as PlayerProfiler‘s ADP demonstrates, Perriman’s draft position has been trending upward more than any other player’s (+56.4 since April/May). Even at an ADP of 83.5, Perriman is still a good value in all fantasy formats. Breshad Perriman was not the only gift bequeathed to us by Ozzie Newsome. In the 6th round, Newsome delivered yet another freakishly athletic wide receiver: Darren Waller from Georgia Tech. You can just imagine Ozzie Newsome sitting in his war room: It’s late; everyone else has gone home, and he’s just waiting for time to pass until it’s his turn to pick again. He decides to quickly visit PlayerProfiler.com to evaluate at some guys left in the board. While he’s flipping through it, he decides to look at Darren Waller. Ozzie’s eyes undoubtedly start to slowly bulge out of his head as he looks at Waller’s PlayerProfiler workout metrics. Darren Waller is a 6’6″, 238 pound giant of a receiver with a 128.5 HaSS (99th Percentile), a 125.4 Burst Score (72nd Percentile), a catch radius of 10.27 (92nd percentile). These kinds of speed-size freaks are almost never available in the sixth round. Even Martavis Bryant, who’s Dominator Rating was significantly lower than Waller’s, was drafted in the fourth round in 2014 by the athleticism snobs in Pittsburgh. Ozzie Newsome understands that the percentage of a team’s receiving yards and touchdowns matters more than counting stats. By appreciating athleticism and leveraging the College Dominator Rating, Newsome may have found the next speed-size freak from Georgia Tech, the run-first football program that gave us Calvin Johnson and Demaryius Thomas. Right, I know it probably didn’t happen like that but you never know. The most important thing is that he signed a gem. A little rough around the edges, but still a gem. Darren Waller is a late bloomer, he’s still very raw as a wide receiver, talent-wise. Waller’s Breakout Age on PlayerProfiler is 22.0 (13th percentile). In his last year at Georgia Tech, Waller caught 26 passes for 442 yards and 6 TDs; not amazing by any stretch of the imagination, but, consider that he only started the final 8 games of the season and scored a touchdown in each of his final 3 games. This tells me that the coaches at Georgia Tech, with their run-heavy philosophy, realized that they had a 6’6″, 238 pound athletic monster sitting on the bench who could… wait for it… help them win football games. Once Waller entered the lineup, the Yellow Jackets steadily became more productive as the season went on. I’m not going to tell you that Darren Waller will be a week 1 starter for the Ravens. He probably won’t, but when training camp gets under way a month from now, we will have much more role clarity. Today, we can only speculate on how the Ravens will deploy him. Regardless of Darren Waller‘s 2015 role, Baltimore is the ideal long term landing spot receivers (see Breshad Perriman, above). In fact, Steve Smith‘s advanced age may actually benefit Darren Waller more than Perriman. Smith’s aging muscles and connective tissue make him more susceptible to injury in 2015. And, even if Aiken or Brown take over the flanker role this year, Waller’s athletic profile and workout metrics suggest he is the best bet to be the Ravens’ flanker of the future. There are some additional hurdles Waller will have to overcome to make the flanker role his own. He may not be the most polished intermediate route runner coming from a college program that features the wishbone attack, however, Demaryius Thomas wasn’t the best route runner when he entered the league from Georgia Tech and it’s still not his greatest strength. The thing is, when you are 6-6, 238 pounds and run a 4.46-40 and are physically comparable to Mike Evans, route running precision may not have much relevance. Even if Walller does not crack the wide receiver rotation as a rookie, the rare interesting news blurb came out of OTAs last week: The Ravens may consider using Waller a pass catching/move tight end to get him on the field while Steve Smith defies Father Time. I can see him starting the season in this kind of role before Steve Smith eventually moves to the slot and Waller takes the starting flanker role with Perriman at split end. The beauty about drafting Darren Waller is the fact that you won’t have to use a lot of draft capital to acquire him. In the wide receiver dynasty player rankings on PlayerProfiler.com, Waller checks in at No. 62. That means he’ll be drafted as a teams 5th or 6th receiver. His upside is too great not to acquire him at this price, and makes him a must-target for the back half of any dynasty league roster. In redraft leagues, his ADP doesn’t even exist. In deep redraft leagues, his ceiling makes him a worthy late-round dart throw. Can we please get a round of applause for Ozzie Newsome? He deserves it.